Earthy, bold, bass-note flavours with an aromatic background characterise this dish. The butter is an easy way to add complex flavours to it and can be made up to two days in advance. 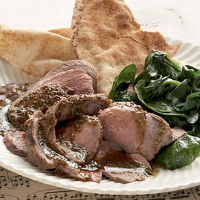 Serve with some wilted spinach and flatbreads. Put all the spices, except the dried chillies, in a warm pan over a medium heat for about 1 minute – once the seeds are warm they will begin to pop and jump in the pan. Remove the pan from the heat before they brown – you just want to tickle out their flavour. Place in a pestle and mortar, remove the husks from the cardamom, and pound to a smooth powder. Add the dried chillies and continue to pound. Put the butter into a food processor; add the spice mix, Tabasco, lemon juice, chopped coriander and salt. Purée to combine. Set aside. Using a small knife, open up the lamb so it is flat. Pierce the meat at 3cm intervals on the skin side, tuck in the slivers of garlic and pieces of anchovy. Season well, rub with the olive oil and griddle or barbecue for about 18 minutes per side. Remove and let rest for 10 minutes; the lamb should be just pink. To serve, carve the lamb into thin slices. Warm the butter just slightly in a small pan and spoon over the lamb. Lamb and cabernet sauvignon is one of the great combinations, but the use of spices here means that a softer Chilean cabernet will work better than a classic bordeaux.